Controlling a smartphone via the sleeve on your coat isn’t something you can do — yet. If Google’s ATAP division has their way, we’ll all have the ability soon. Announced during a Google I/O session, Project Jacquard swings for the fences; Google even tapped Levi as their lone launch partner for Jacquard. The idea is that by weaving metallic threads into the fabrics we come into contact with during our day will have the ability to control a piece of tech. The thin metal fibers don’t have to be in denim, or even woven into a flat fabric. Project Jacquard’s can also work with thicker items like wool, or a textured material. 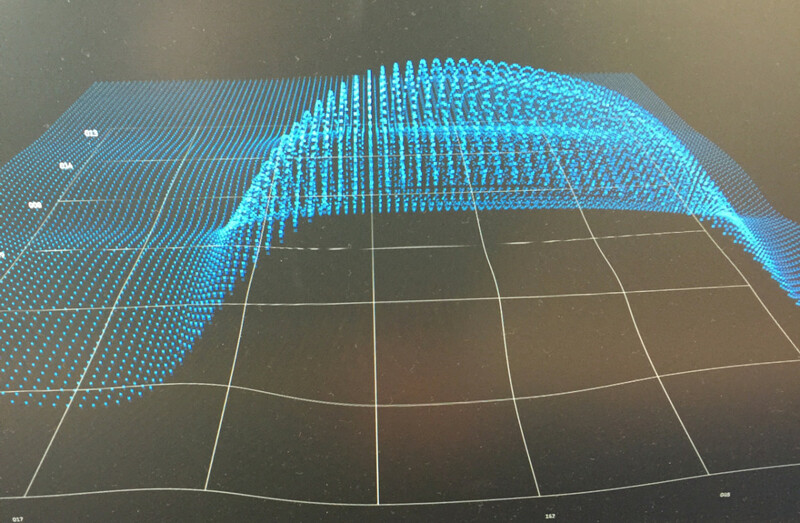 At a Google I/O display booth, ATAP had Jacquard set up for our perusal. What you see in the image below is a representation of how the metallic fibers actually sense your fingers touching it. As the fabric is pressed, we see the bottom grid give a bit. The blue overlay is the visualization of your finger or hand. You can press a palm down and elevate the entire blue grid. 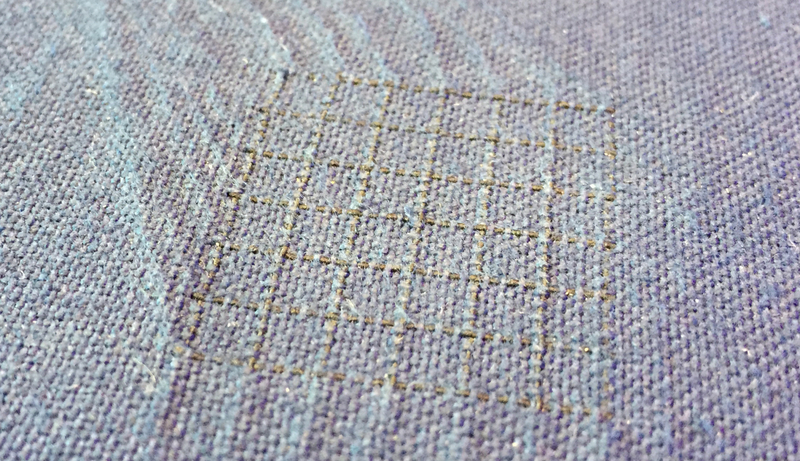 The fabric even picks up where your fingers bend and shows a small ridge in the blue grid. 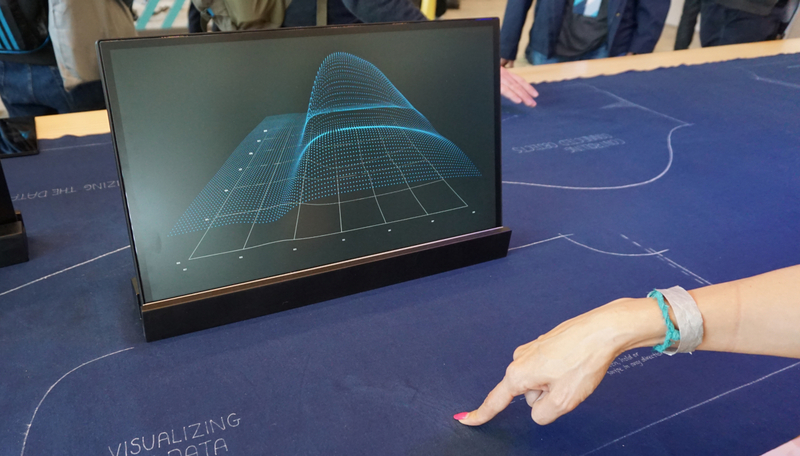 As I moved a finger across Project Jacquard’s connected fabric, it displayed on-screen in real-time. Even multiple fingers and more complex action displayed instantly. The tech Project Jacquard fabric links to may come in the form of a TV, or a phone. It might be your car, or tablet — or even your desktop computer. Just as Project Jacquard can be implemented into any material, it can similarly communicate with any kind of device. Google tells me the actual fiber that powers Project Jacquard can be spun so thin it can be woven into silk. 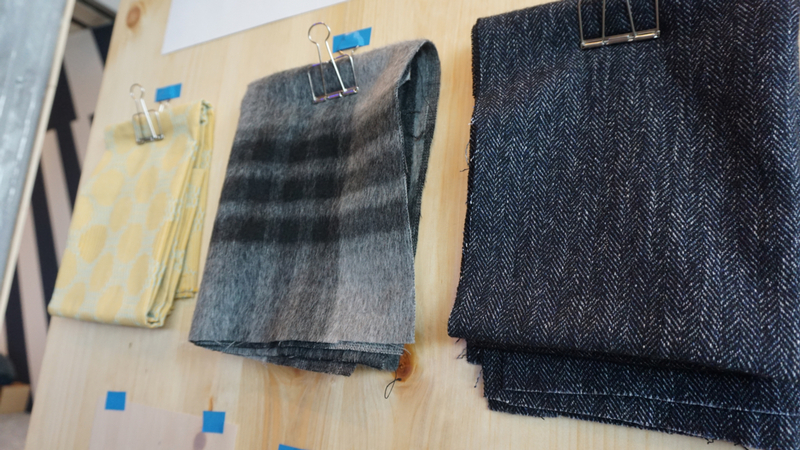 Levis doesn’t make silk, but denim will test the fibers in other ways. If Jacquard stands up to the rigors we put denim through and remain receptive to touch, Google may have an actual winner on its hands. In my testing, the fibers are receptive to firm touch, but not the delicate interactions you have with your smartphone. The small grid of metal fibers woven into the fabric will acknowledge your finger pad, but not your actual finger tip; you’d need to make broad strokes and significant taps, not glide across the touch-capacitive surface as you likely do with your phone or tablet. That’s fine, though; ATAP isn’t aiming for Project Jacquard to eliminate smartphones or touchscreens. Google simply wants to allow us interaction beyond them. And Project Jacquard may find itself on all manner of fabrics. Not only is it made with the same manufacturing process as existing fabrics, the touch capacitive portion of the fabric can be manifest in any shape or size. Your entire coat sleeve could be interactive, or just part of the pattern on it. If you wore a coat with repetitive squares, one could be receptive to touch. If that square pattern were instead stars, one or more of the stars could end up as your touch interface. The form factor of the fiber alongside the ease of manufacturing will allow Project Jacquard to find a home in just about any fabric you find yourself touching. The arm of the couch may control your Android TV, or a curtain may communicate with your Nest Thermostat. Grabbing the handle on your computer bag may lock the devices inside. The simplest example of how Project Jacquard was useful in day-to-day life was with Google’s mobile music player. Via a touch or swipe either way, you could control the playback, track and volume. Sounds a bit redundant when compared to a smartphone, but Project Jacquard has use cases. Runners will likely love the ability to pause a track by tapping on their shirt, and those who aren’t into smartwatches may enjoy silencing the notification vibrations their phones make in a pocket by swiping a coat sleeve. During the session announcing Project Jacquard, ATAP had a familiar narrative; they want us interacting with our environment rather than our tech, and connected clothing accomplishes as much. It’s the same thing we’ve been hearing about smartwatches. The difference is, ATAP is connecting tech to existing wearables with Project Jacquard. Smartwatches aren’t for everyone. Clothing is. Project Jacquard might be, too. Someday.